SAINT MARY MAGDALENE MUST BE SMILING....! 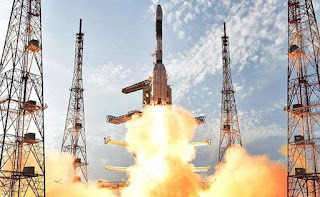 It is one year since India made space history launching 104 satellites in one go- from a single rocket.Out of them 101 belonged to other countries-96 from the US,1 each from UAE,Israel,The Netherlands,Switzerland and Kazakhstan. 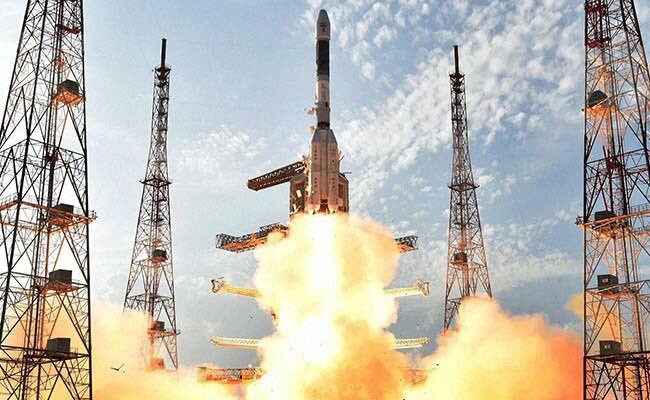 The event broke the world record of 37 held by Russia.Again just 2 weeks back-on 12 Jan 2018- India has launched its 100th satellite along with 30 others from different countries including US,Canada,Finland,France,South Korea and UK. Considering the fact that it is only 70 years since India got changed to an independent India from a colonial past, the events are epoch making in the fields of scientific space explorations.The technology and science so mastered by ISRO-Indian Space Research Organisation where few of of Engineering classmates also have been working-will have direct repercussions on the present and futuristic overall development of the country.While people like me take undiluted pride in these matters,also I understand that there are many especially in the western and developed world who are sarcastic and critical about these events, if cartoons that came across some of their newspapers on those days are any indications...but that is their privilege . It was in 1962 that Indian National Committee for Space Research was formed. 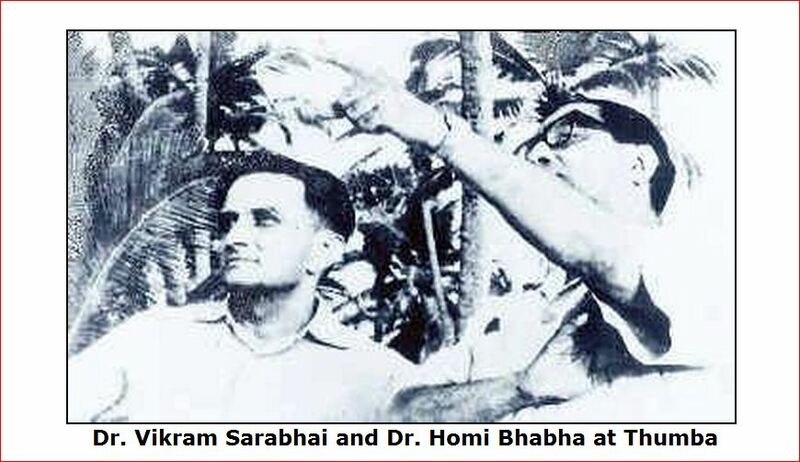 Father of Indian Space Exploration Vikram Sarabhai was entrusted to find a suitable site to establish a rocket station.His search was finally zeroed on Thumba.If there is a similarity of this name to Tampa,Florida close to which Kennedy Space Center is located, it is purely coincidental.That was in 1963. Thumba , not far from Thiruvanathapuram,capital of Kerala was a little known fishing village by the side of Arabian Sea.Residents were mostly poor fishermen and families, living in thatched huts with an old church-St Mary Magdalene church- in the centre. 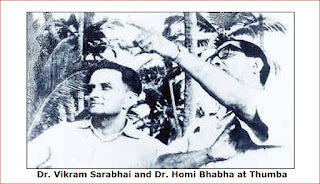 Dr. Sarabhai was particularly interested in this location since it was close to magnetic equator and matched other parameters he was looking for. Interestingly the team consisted of Abdul Kalam also, who later became India's missile man,President of the country and ultimately one of the excellent human beings modern India has produced.He was a scientist junior to Sarabhai then. 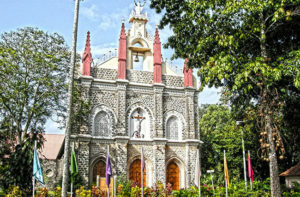 Once the site of approx 600 acres was located finally, the problem was how to acquire the land and properties- that too of an old church and a Bishop's house, since the scientists were on a fast track mission.Land acquisition for public projects is a real problem even now since the state is among the mostly densely populated states in the country. When such a situation involves a prominent temple,mosque or a church, it becomes much complex even today anywhere in India.Instead of going through Government agencies Sarabhai and his team decided to meet the Bishop themselves.In hindsight I would say it was a brave and wise decision. a space museum named as "ALTAR OF SCIENCE"
Church becomes a workshop...Bishop's house a design and drawing office! Sarabhai visited the Bishop Rt.Rev Dr.Peter Bernard Periera,who later became an Archbishop, on a Saturday it is recorded.One should remember that at that time space exploration even in US or Russia was in infant stage.Only in 1969, 6 years later that a man could be sent to land on moon.In India hardly anything existed in the matter. The Bishop listened to him patiently but instead of giving a yes or no, Sarabhai was asked to be in the church the next day for the prayers during which the Bishop would ask parishioners their opinion.Abdul Kalam has vividly written the scenario of the visit of Sarabhai to church in his book 'Ignited Minds:Unleashing the power within India'.I shall quote here what he has written in verbatim. Quote:"the Bishop told the congregation,"My children,I have a famous scientist with me who wants our church and the place I live for the work of space science and research.Science seeks truth that enriches human life.The higher level of religion is spirituality.The spiritual preachers seek the help of the the Almighty to bring peace to human minds.In short, what Vikram is doing and what I am doing are the same-both science and spirituality seek the Almighty's blessings for human property in mind and body.Children,Can we give them God's abode for a scientific mission?" There was silence for a while followed by'Amen' from the congregation, which made the whole church reverberate".Unquote.I am sure that the Bishop might have done a lot of home work for that outcome since these matters are complex to be solved. 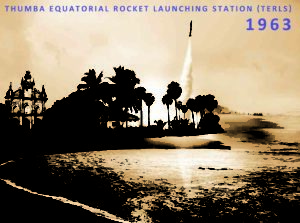 In another 100 days flat, Thuma Equitorial Rocket Launching Station(TERLS) was made operational, a forerunner of present VSSC-Vikram Sarabhai Space Centre. The first rocket takes off...church is preserved as "Altar of Science"! That was the time when India was struggling financially.Going round the wealthy nations with a begging bowl occasionally was not unusual- pet named as 'aid'.US cargo ships carrying wheat and milk powder docked at Indian ports were always welcomed and used to a news item in newspapers!As such one can imagine the plight of TERLS as little funding and facilities were available. Probably the cartoonists and editors of those western press who are critical of India's space missions now may not be aware of a changed India or worse, do not want to be aware of!! Sarabhai and the core team,working against time and material, decided to use the church building as the prime workshop and laboratory, while the sacred altar was well preserved, typical of India's proud heritage.The Bishop house was used as an office for designing and drawing.They did not leave even the existing cattle sheds it seems.They were used as stores!Abdul Kalam has confirmed in his book that the first rocket was assembled in the church and transported to launch pad by truck but the pay loads for the launch on bicycle!! 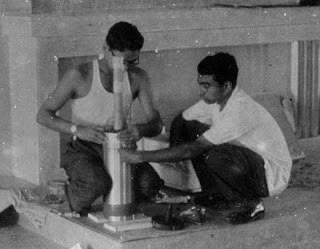 I shall conclude with two photos reproduced below.The first one shows Abdul Kalam and his colleague working on a rocket inside the church.The second one shows the first rocket take off at TERLS with the church building as silhouette..
Saint Mary Magdalene must be smiling! !